If there is a UFO reality, then why has no one blown the whistle? Informants in the U.K. have been talking about UFO's and Flying Triangles because they see them every day. I have been a faithful subscriber to UFO rags from the U.K. for a long time. These magazines try to use a more down to earth approach as to which UFO's are extra terrestrial and which aren't. In the British UFO Magazines there is no question as to whether or not UFO's exist. In order to understand what I am trying to tell you, you need to understand why Ufology in the UK is commonplace, you need to realize Britain's UFO history. Britain has always been the center of "paranormal" anomalies. From strange structures, to ghosts, to intricate crop circles. With all of these strange things happening you'd think that there would be unlimited investigations. There are your amateurs and then there are some that are appointed. One man in particular is Nick Pope, who joined the British Ministry in 1985 and was involved in policy making during the Gulf War, and the Bosnian-Serb conflict. Pope was then moved in the summer of 1991. He was appointed to a new post at Whitehall Secretariat Air Staff, Department 2A. I guess you could call it the equivalent of the "X-files." As with any classic "I don't belong here" story Pope did not believe in the UFO hysteria, and was very skeptical about the Paranormal. After dealing with the reports from the "UFO" desk Pope was slowly changing his mind on the issue. After 3 years at the "UFO" desk Pope declared that UFO's were a reality. He concluded that there was plenty of evidence to prove their existence. Pope was officially supposed to investigate whether or not these strange aircraft posed a threat to the UK's defense. Unofficially He was expected to dismiss their existence. Pope decided it was up to him to tell the truth about UFO's. Pope claims that his peers and the department labeled him a loose cannon and found him to be very suspicious. They lost trust in him. But Pope stood by his story, analyzing all the data, and claiming that it all added it up to a case for the existence of UFOs. A lot of the M.O.D. workers began humming the Twilight Zone theme when ever he would walk into the room, and after the X-files made it to the UK they called him "Spooky." After all of the ridicule, and after claiming that he felt UFOs posed a major threat to our defense systems, Pope was moved in 1994 from the M.O.D. to the financial department. The thing that is most frustrating is despite Pope's entire candor, he is still bound by Britain's official secrecy act. So is what Pope saying fact or fiction? Apparently it's fact. UFO's are being seen in Britain Some say it can be explained, but Pope says that a technological threat of non-human origin exists. Some say it is Science fiction, Pope continues to investigate such claims. Even though it really isn't his job any more. 1989-Petit Rechain, Belgium. One of the most famous UFO pictures ever taken. The photographer, to my knowledge, still remains unnamed. Taken on an April night during a well known "wave," the photo very clearly shows a triangle-shaped object with lights. One of the best proofs of UFOs we have. Original photo was too dark to show object outline, and had to be lightened. Many of the Belgian objects were filmed, but negatives were blank, which indicated to researchers that either electromagnetic or radioactive anomalies were present. 1990-Wallonia, Belgium-This photograph was part of the Belgian Wave of 1989-1990. Taken by J.S. Henrardi on June 15, 1990. Mr. Henrardi released all copyright ownership to the photograph in 2003, making it available for public use. 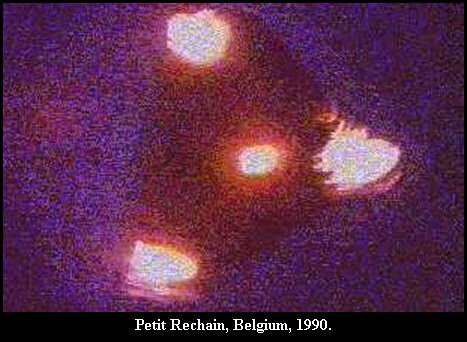 The object very closely resembles the Petit Rechain triangle (above), also part of the Belgium wave. The triangles were reported by hundreds of witnesses during the wave over Belgium. 1997-Phoenix, Arizona. One of the most publicized UFO events in history. 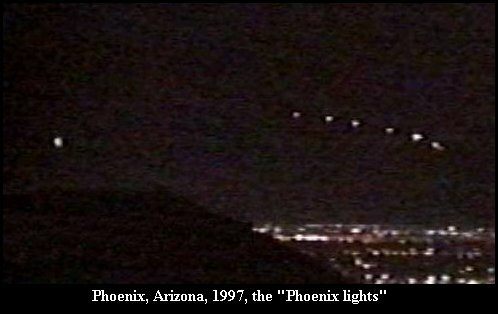 First observed in a hexagram pattern at about 7:30 PM over the Superstition Mountains area east of Phoenix, the characteristic 8+1 formation of amber orbs was next seen in two separate arc patterns with "trailing lights" over the Gila River area at about 9:50 and again at 10:00 at the southern edge of Phoenix, were they were seen by thousands and videotaped by a handful who had camcorders close enough at hand to catch the fleeting minutes of their displays. Objects seen were described as ovoid and also triangular. 2002-Glascow, Scotland. The photographer said he took the picture at about 10:00 P.M. in Glasgow, Ayrshire, Scotland. He said: "At around 10pm 2 months ago I was looking out my window (I was actually looking for my cat that had ran out the door) when I saw this strange thing in the sky as soon as I seen it I just grabbed my digital camera and took a picture... after I took the picture I turned round to give the camera to my girlfriend... Looked back and it was gone... There was no noise just total silence. P.S. the pic isn't great my hands were a bit shaky." 2002-Las Cruces, New Mexico. Taken on October 5, 2002. 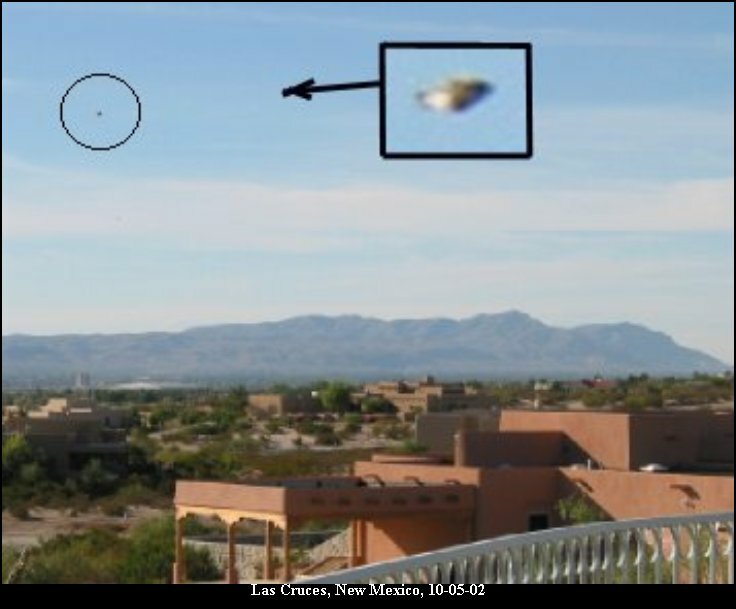 Witness stated: I took 4 pictures of the mountains to the west of Las Cruces, NM. The camera was a Canon G2 digital. The last shot taken at 4:49 pm was enlarged after downloading to a computer. Only then were the images of 2 objects noticed in the sky. One in the upper left was disk-shaped (enlargement showed it to be triangular) and appeared metallic in luster. A second object, below and to the right of the first, was apparently much smaller and/or further away. A previous shot taken 2 minutes earlier showed no objects. 2003-Wisconsin-Photographer was taking photos of Mars, which was rising early on 01-08-03. 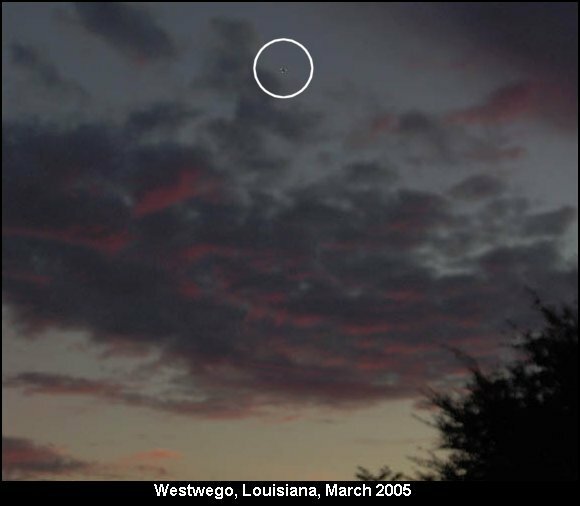 Mars was close to Venus, and the witness took several photographs. He was not happy with his first photos, because of the cloud cover. So, he took a few more snaps, and just before calling the session over, he noticed a slow moving object, fairly bright to the naked eye. He took a couple of photos of it, and was surprised later when he reviewed the photos. 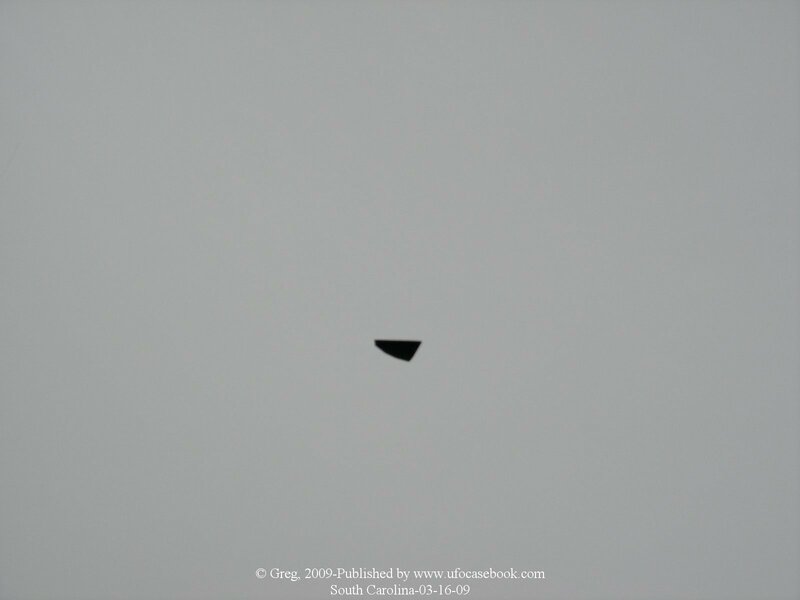 What he captured on film was a definite triangle shaped object. Taken at 7:18 AM. 2005-Kaufman Co. Texas. February 9. Taken by videographer extraordinare lawwalk. Two red lights going east at not too fast a clip. Looked like two horizontal lights side by side at first with no noticeable flashing lights which caught my attention plus I didn't hear any sound from it. As I zoomed in on it, it shows to have three lights in a triangle shape. I got about thirty seconds or more of it before it went behind my house. I'm not real good at this night time discerning of what some of these lights are, because, heck you can't see the shape, could be anything. 2005-Louisiana. March 4. My co-worker’s 13-year old son was in his back yard in Westwego, LA, taking a picture of the sunset. When he downloaded his pictures to his computer he noticed a spot in the top center of the photo (first photo). When you enlarge the area you see a triangle with lights on each tip (second photo). If you look even closer, you can see a black dot to the right and above the triangle (close-up of this in third photo). Westwego is directly across the Mississippi River form New Orleans. Do Flying Triangles Have Underwater Bases Around Our Coast? 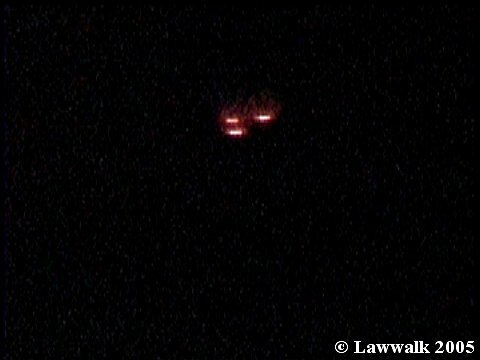 The arrival of a Flying Triangle UFO craft in Missouri and Kansas in 1980, caused concern and wonderment, as hundreds of witnesses, including policemen, watched a huge craft displaying a triangular pattern of lights, move slowly over the countryside for a period of four hours. It was seen over 22 towns and at one stage the enormous craft appeared to be dropping what a local truck driver described as satellites, which appeared to be round and emitted a bluish glow. The whole event was tracked on radar during the four hour period and must rate as one of the most awesome sightings to date. 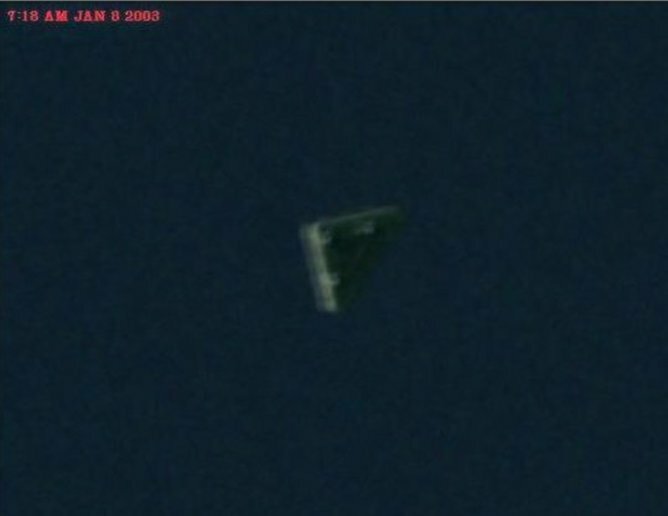 One witness described the Flying Triangle as being "as big as a football field." This event was the first indication of their presence, but within a decade, Flying Triangular craft were to be reported world wide. During January 1981, a huge boomerang shaped craft was seen over Arizona, with one witness proclaiming the object "was bigger than several football fields!" The Vshaped craft was later reported over New York State and Connecticut in March 1983. 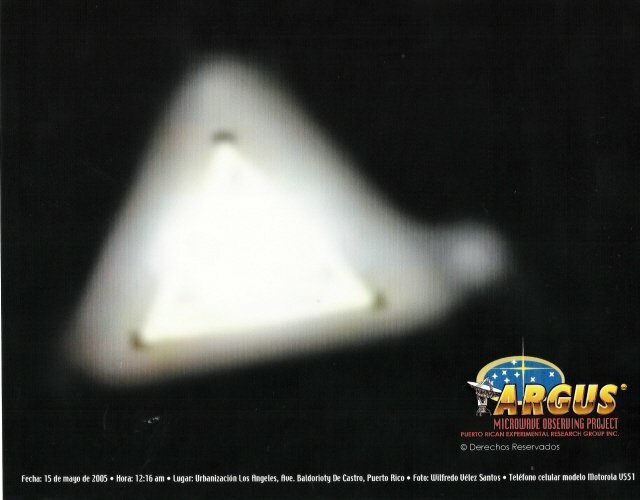 Once again the craft was described as being "as big as two football fields" and this time, the craft flashed its lights on and off as though trying to attract attention. The next major event was the Belgian Flap, when huge triangular craft visited this small country during the period 1989/90. The SOBEPS Group (Societe Belge d Etudes des Phenomenes Spatiaux), were inundated with hundreds of reports during this period. Such was the efficiency of their organization that the Belgian Air Force asked for their co-operation and assistance! With SOBEPS members being widespread throughout the country, they were able to identify Flying Triangles in their locality and report their position to the Belgian Air Force. In this manner, the SOBEPS members acted as trained observers for the Belgian Air Force. At one stage, two F16 interceptor fighters were placed at their disposal, to be directed to various parts of the country where the FTs were reported! This co-operation resulted in the F16s intercepting a number of the Flying Triangles, although the aircraft were completely unable to match the speed and manoeuvrability of the FTs, as subsequent cockpit radar film footage showed. 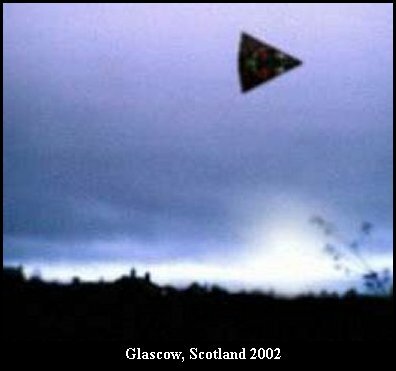 There had meanwhile been a number of isolated reports over the UK, but on the 26th September 1993, a huge Flying Triangle craft arrived over Bakewell in Derbyshire. Many residents of this small town were to share in the experience of watching a huge black craft, slowly and silently flying over their town. With a bright white light on each corner of its triangular shape and numerous smaller lights running along the edges of the craft, the FT flew low and at an estimated speed of only 30 mph. (A witness driving his vehicle at 40 mph overtook it!) The triangular craft the performed several slow manoeuvres over the town before returning to its original course and flying slowly out of sight. It was just a few months later, on January 6th 1995, that a British Airways Boeing 737 aircraft was buzzed by a glowing triangular craft as it approached Manchester Airport! This was the forerunner of a Flying Triangle invasion, as the FTs then began to arrive in force. There were 52 FT incidents recorded in and around the city of Derby from December 1994 to May 1995. These included hovering illuminated craft and in one instance, a huge triangular craft was observed hovering over one of the main traffic islands (Spider Bridge) on the A5111 circular road. Numerous witnesses were able to sketch and describe the FT craft in detail. The reports include FT craft hovering and shining down white beams of light onto the countryside at night. Lights have been reported on numerous occasions, but it seems highly unlikely that they are searchlights as such. Our new Doppler Radar technology enables present day satellites to look down through any weather onto the ground below and we presume that the FTs are the product of a far more advanced technology. The purpose of the FT searchlight beam could be something else, but what? Witnesses have described the FTs white beam of light as sometimes "ending in mid air, like a fluorescent tube." As the number of FT reports have increased, a pattern of behaviour has begun to emerge. The FT craft appear to be coming in over the East coast of England and flying slowly across the countryside to various destinations including a number of Nuclear Power Stations, before returning back out to sea a few hours later. 1995 - TOTAL FT REPORTS - 1797 of which 476 were observed over Nuclear Power Stations. 1996 - TOTAL FT REPORTS 1437 of which 988 were observed over Nuclear Power Stations. 1997 - TOTAL FT REPORTS - 1339 of which 1242 were observed over Nuclear Power Stations. The latest information from the Essex UFO Research Group under the able leadership of Ron West, (sadly no longer with us) (one of thirty groups operating under Project FT), states that since 1995, there have been reports of FT craft being seen entering and leaving the sea off the East coast near Lowestoft. There have also been 25 reports of lights seen moving under the surface of the sea in the same area. Could FTs have an undersea base somewhere along this coastline? Certainly, similar underwater activity has been reported from various parts of the world. One startling coincidence has recently come to light and that is the number of references made to the subject of underwater bases by Larry Warren in his book Left At East Gate. The book deals primarily with the UFO incident in Rendlesham Forest, which took place in late December 1980, but then Larry Warren then goes on to reveal a further event. It appears that after the Rendlesham Forest incident, he got himself into trouble with the authorities by telephoning his mother about the UFO landing. He was subsequently ordered to go to a certain parking lot on the base where he would be met by a dark blue sedan car. When Larry arrived at the parking lot, he saw the car. As he entered into the vehicle, he remembered a greenish glow and then by all account, lost consciousness. He later recovered to find himself in an underground complex under the Woodbridge base, where he learnt from a black uniformed guard that it was part of a tunnel complex that led to the North Sea (p61). Larry Warren was then taken into a strange darkened glass room, where he was contacted by a telepathic alien figure, partly hidden by a glowing screen. Larry then learnt that he was in an underground complex that had been built in the 1940s. The complex contained many aliens, with their support personnel; Larry went on to state, "The crafts they travelled and entered and exited via an extensive tunnel system. One exit was a mile off Lowestoft, Suffolk another, near Orford Key." 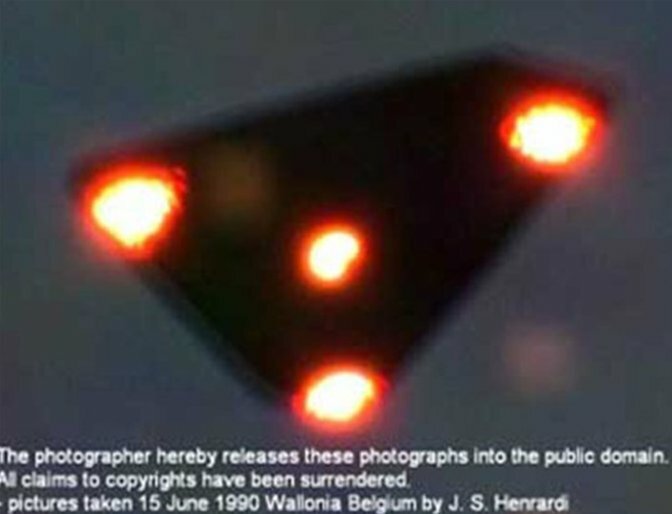 If Larry's encounter with the alien is true and not a hallucination, could it mean that the aliens are controlling the Flying Triangle craft that have been reported disappearing into the sea off Lowestoft? If there is an underground facility at the Woodbridge air force base, does it have tunnels leading to the North Sea? Larry Warren claims that it does *. His co-writer Peter Robbins states, "It is quite an amazing aspect of Left At East Gate and one I am convinced is real though what REAL means has yet to be established".